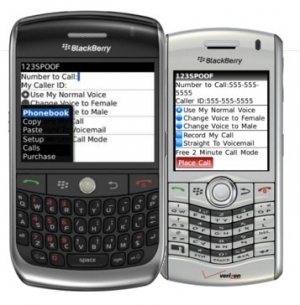 Free Caller ID Spoofing for Blackberry | BlackBerry Blast! "123SPOOF Mobile is a revolutionary Blackberry application that gives you COMPLETE control over your phone calls, empowering you to change Caller ID, disguise your voice, record your calls, and more! All this is combined with seamless BlackBerry integration. Best of all, 123SPOOF Mobile now lets you make unlimited calls for FREE. You don't even have to sign up or enter any personal information to take advantage of this amazing offer! What's the catch? When making free calls, 123SPOOF Mobile requires that you listen to a short, nine second advertisement. Users who want to take full advantage of 123SPOOF Mobile without ads can sign up for an account online or inside the app."